NEW YORK, NY (Feb. 21, 2011) – Unbeaten Dominican knockout specialist Javier “El Abejon” Fortuna will be fighting for the vacant World Boxing Council (“WBC”) Youth Featherweight Championship on the “Diamond Elite” card, headlined by 2010 Fighter of the Year Sergio “Maravilla” Martinez, March 12 at MGM Grand Arena at Foxwoods in Mashantucket, Connecticut. 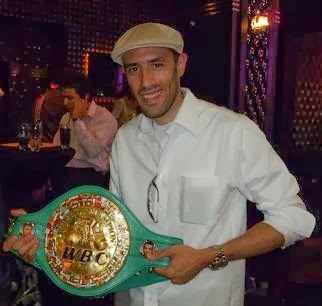 Martinez (46-2-2, 25 KOs), the reigning WBC Emeritus and The Ring Magazine middleweight champion, takes on World Boxing Organization (“WBO”) junior middleweight champion Sergiy “Razor” Dzinziruk (37-0, 23 KOs) in the 12-round main event for the vacant WBC Diamond middleweight title. In the 10-round co-feature showcasing ethnic rivals, “Celtic War” matches exciting middleweights Andy Lee (24-1, 18 KOs) of Ireland and Scotland’s Craig McEwan (19-0, 10 KOs) in a battle with potential world title shot implications for the winner. Martinez vs. Dzinziruk and Lee vs. McEwan will air live on HBO World Championship Boxing starting at 10:30 PM/ET, 7:30 PM/PT. The 20-year-old Fortuna (13-0-0-1NC, 10 KOs) faces Derrick Wilson (8-1-2, 2 KOs) in the 8-round, chief off-television bout of the evening. Fortuna is handled by the same advisor-head trainer combination, Sampson Lewkowicz and Gabriel Sarmiento, respectively, as his stable-mate, Martinez. In his last fight this past December, the Dominican prodigy knocked-out previously undefeated Victor Valenzuela (8-0) in the opening round of their fight in New York City, marking Fortuna’s U.S. debut. Past WBC Youth featherweight champions have included current WBC lightweight king Humberto Soto, former WBC featherweight title holder Rudy Lopez, and world title challengers Tommy Browne, Eduardo Escobedo and Billy Dibb. “Diamond Elite: Martinez vs. Dzinziruk” is being presented by DiBella Entertainment in association with Gary Shaw Productions and Banner Promotions. Lee vs. McEwan is being presented by DiBella Entertainment in association with Golden Boy Promotions. Tickets are priced at $450.00, $250.00, $125.00, $75.00, and $50.00 and on sale through the MGM Grand at Foxwoods box office. Tickets can also be purchased online at www.mgmatfoxwoods.com, by calling the MGM Grand at Foxwoods at 1-866-646-0609, or in person at the MGM Grand at Foxwoods box office.